DAANET introduces two new unmanaged Gigabit Ethernet switches added by Hirschmann recently to the SPIDER family. The SPIDER II Giga EEC Pro, available with five twisted pair ports or two additional SFP slots for fibre optic transceivers supports Quality of Service (QoS) compliant with IEEE 802.1D. 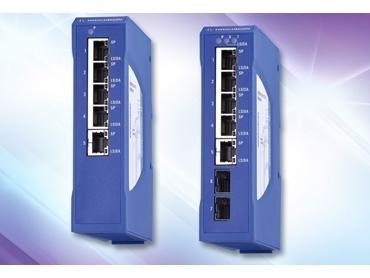 This allows prioritisation of data packages and means that the switch can be used for instance, for PROFINET applications in the mechanical engineering sector. The SPIDER II Giga EEC Jumbo is also available in two different 5-port versions, with or without SFP slots. Since both versions can handle Jumbo Frames with up to 9014 bytes of user data, they are particularly suitable for video applications. All switch versions conform to relevant industry standards for shock and vibration resistance as well as electromagnetic compatibility (EMC), and are built to comply with cUL508 safety requirements. Features also include 12/24V power supply, IP30 protection rating, fanless cooling, and an extended temperature range of -40ºC to +70ºC. DAANET technical specialist Adam Rickards explains that support for Quality of Service and Jumbo Frames means inexpensive unmanaged devices can now be used in applications that were previously exclusively the domain of more expensive managed switches.